A picture of me on my ordination day. Today is Good Friday. 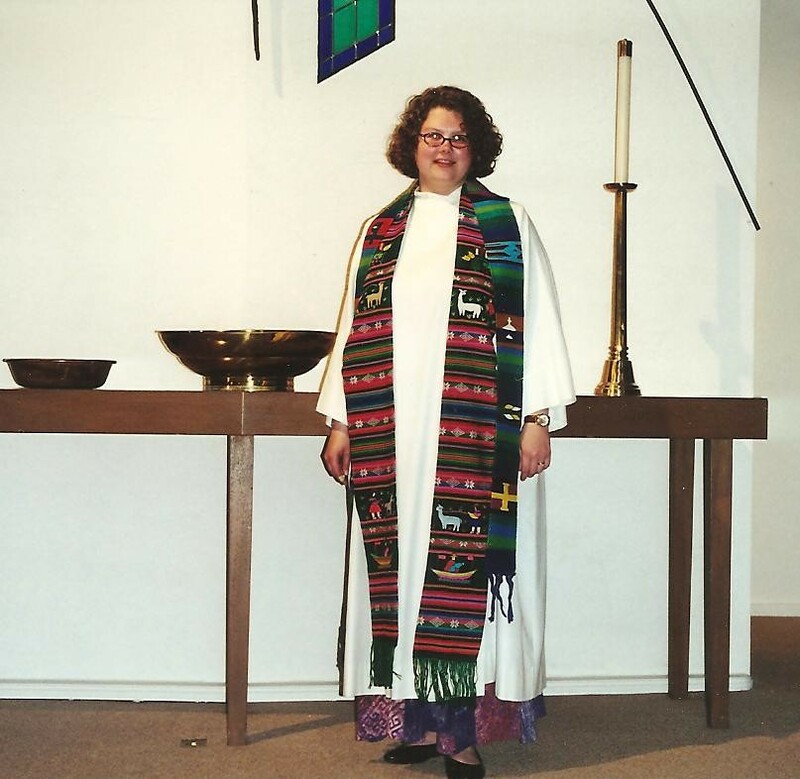 It is also the 10th anniversary of my ordination into Christian ministry. Every year during Holy Week, I give thanks with all my heart to be a part of this pastoral life. I was with Christ in Spirit throughout today. I learned that I have the wonderful ability to withdraw from this world and put myself in another. … Thank you, Jesus. I am just beginning to understand Your love for me. 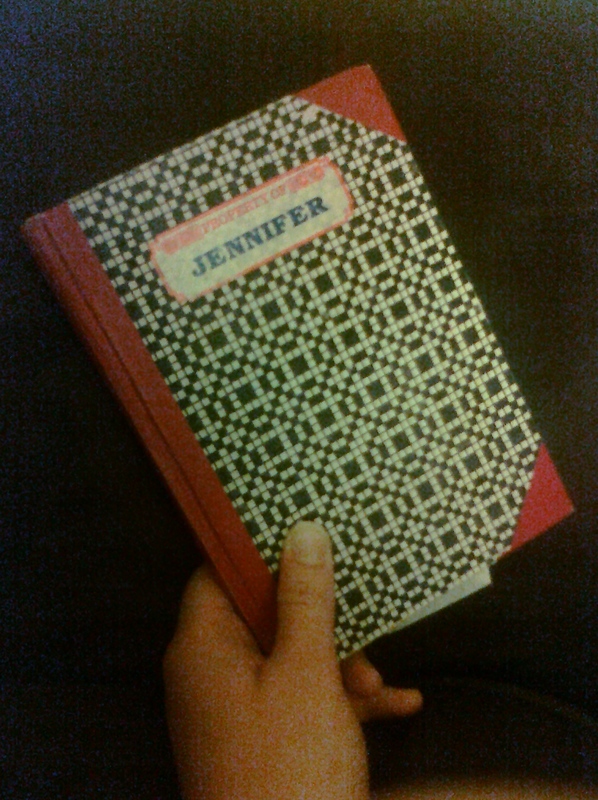 My journal from 1989, when I was 15. Every year since that discovery, I have tried to recreate it—to step outside of the ordinary during Holy Week and get swept up in the ancient story. I don’t think of it as “another world” anymore, nor do I invest much energy in imagining myself in the streets of Jerusalem 2,000 years ago. However, I still love to get absorbed in it, to experience its meaning anew, and to forget all other concerns. Some years there are more distractions than others, but the act of walking through the stories and services every year never fails to transport me to a holy place, with deep conversations with God and exhausting emotions. Because of my life in ministry, I not only can throw all my energy and focus into meditating and understanding and retelling the story of Jesus’ betrayal, death and resurrection, I must. During Holy Week, with all the writing and preparation, I spend all day every day praying and thinking and writing about the story of Jesus. I abandon all other church work, give up on housecleaning, let J take the role of lead parent, and just live into the story. 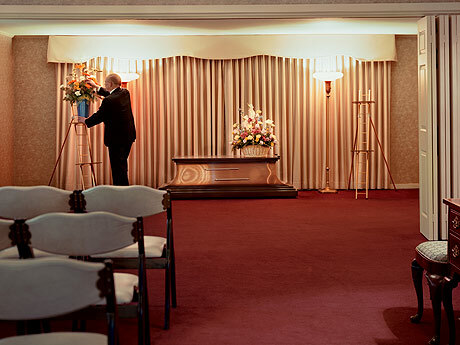 There is no negotiation about whether or not to attend services on Thursday or Friday or both, because I have to be there for all of it. 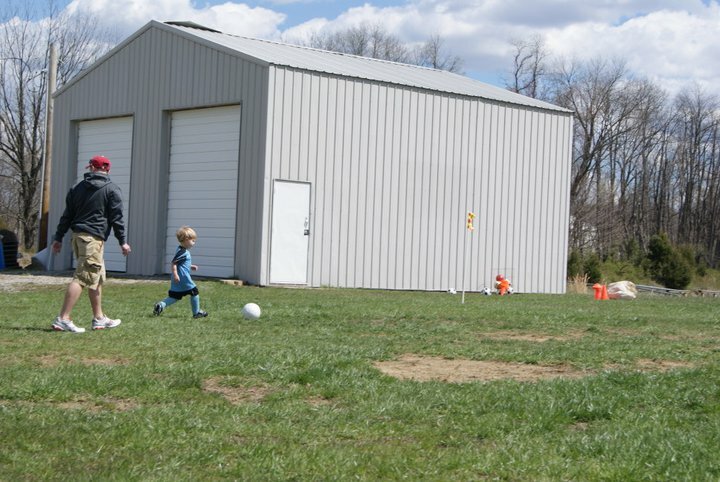 There is no conflict over soccer games or meetings with the boss or anything else—everyone knows that, during Holy Week, the pastor has no more important task than preparing for services through prayer, meditation and writing. If I am wrought with emotions and wracked by the Holy Spirit throughout, so much the better for my preaching. What a privilege. So today, Good Friday, I celebrate 10 years of ordained ministry. Ten years of throwing myself into Holy Week with all my heart and soul, and having no one think it strange. 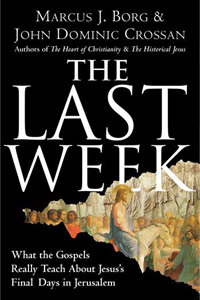 Did I know in my 15-year-old self where that blessed Holy Week would lead? Could I have imagined the opportunity not only to let myself get lost in Jesus’ story every year, but to devote my life’s work to getting other people caught up in the story as well? There is no better time to celebrate my call, to give thanks to God for this pastoral life, than during Holy Week. Thanks be to God. Soli Deo Gloria. 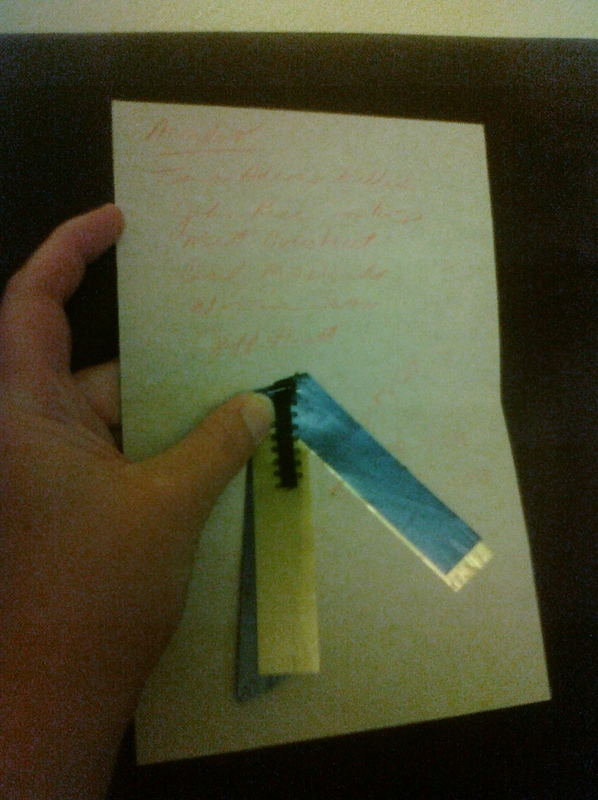 The phone message my mom wrote about the accident, and the memory ribbon we wore for weeks. Both were tucked inside my journal. 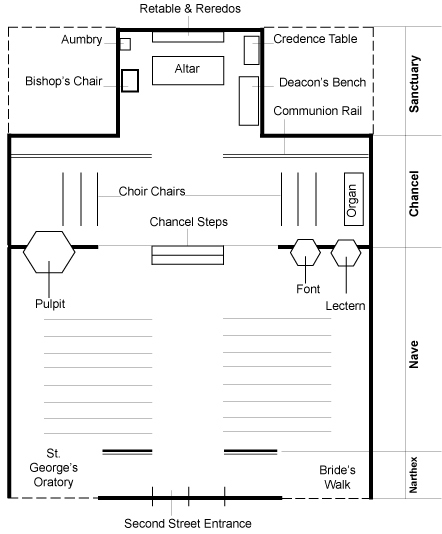 Postscript: There is another connection between the spring of 1989 and my ordination date that cannot go unmentioned. Just a few pages after my passionate account of Holy Week in my journal, the April 22 entry shares the news of a car accident that took the life of one of my dear friends, and injured several others. It was another pivotal moment in my faith journey. When I scheduled my ordination years ago, I recognized the confluence, but still cannot impart a meaning to it. Still, this year, all three converge–that transformative Holy Week in 1989; my friend’s death on April 22, 1989 (both 22 years ago); the 10th anniversary of my ordination on April 22, 2001; and Good Friday. The day feels deep, rich and complex. God sees the web of connections, and perhaps even their meaning. I, as yet, do not. 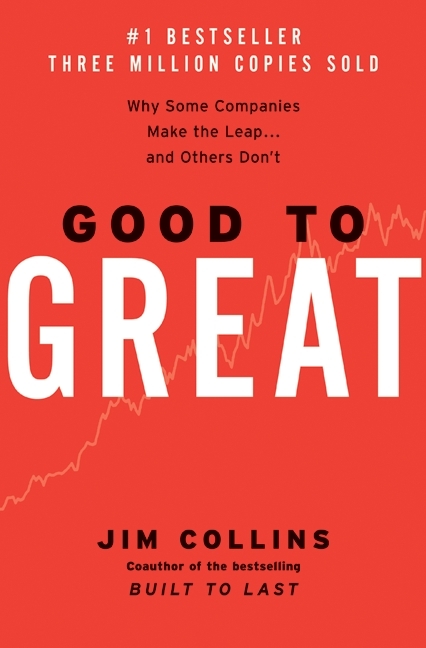 Good to Great: Why Some Companies Make the Leap… and Others Don’t by Jim Collins, HarperCollins, 2001, 300 pp. Good to Great for Social Sectors by Jim Collins, self-published, 36 pp. I am always cautious when people try to apply the principles of running a good business to running the church. However, Jim Collins’ work is more about leadership and organizational development, and those kinds of ideas can easily be modified and adapted to the church world. 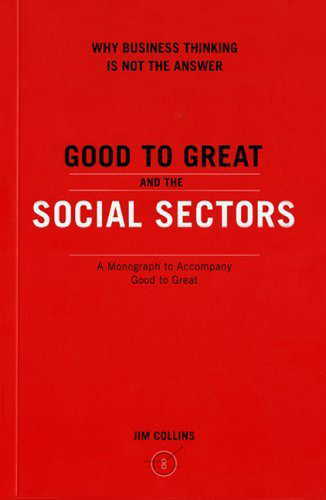 His original research and ideas in Good to Great were so popular in the non-profit sector (including the church) that he wrote the secondary monograph to explore how to make those adaptations. His work is based on deep analysis of corporations that have been successful for the long term, defined as at least 15 years, and he identifies the core characteristics of companies that make the leap from good to great. I’ll comment briefly on the insights that I’ll take away from each, freely mixing between the two volumes. I know I am late to the party on this (the book is 10 years old, and well analyzed by pastoral leaders), but I want to process what I think that church leaders could learn from these guidelines. 1. Level 5 Leadership: a leader who combines personal humility and professional will, rather than charisma or packaged programs. The Level 5 leadership Collins describes is very apt for pastoral ministry. We all know clergy who are charismatic, who wow crowds with their preaching and publish books by the scores. However, their churches often do not survive losing them. Level 5 leaders, on the other hand, may never have a famous name, but they build an organization that lasts by putting the good of the institution above their personal gain, measuring success not by their personal progress but the strength of the institution. Some of the best pastors I know have built great churches that last and grow–but they are not snazzy preachers or sought-after speakers, although they are certainly competent in those areas. What they know how to do is develop faith and leadership in others, and always defer to the wider group rather than touting their own success. We in the church should affirm the gifts of these Level 5 leaders. 2. First Who… Then What: a primary focus on getting hardworking, team-playing people with the right skills and passions into the organization, then figuring out what to do and how to do it. In my ministry, this has proved critical. If we can get the right people in the right positions, great things will happen with little direction or motivation from the pastor. On the other hand, we don’t hire and fire church members, lay leaders or volunteers. Part of being the church is working with who God sends, and faithfully welcoming every soul into Christ’s service. This is also especially tricky when working with volunteers and church members who may have served for a long time in the “wrong” position. Just because everyone is welcome in the congregation does not mean that everyone has the gifts to chair the Council, teach the children or manage the finances. I practice this “first who” by never asking for volunteers anymore. When a task arises or position opens, I prayerfully consider who I think the right person is, then consult with the other leaders in charge of nominations. We then ask that person directly to serve. It takes extra time and energy up front, but saves so much difficulty and energy later if you have to motivate or direct the wrong person. If you get that right person, they can get more right people to work with them. 3. Confront the Brutal Facts (Yet Never Lose Faith): a willingness to name and grapple with harsh realities, accompanied by a steadfast commitment and confidence that success can happen anyway. If that’s not at the core of our Christian faith, what is? We follow a God who took up the cross, facing and calling out the brutal realities of death, sin, violence and empire—only to be resurrected three days later, having overcome them all. Yet far too often, we in the church are not willing to confront harsh facts. We are declining, young people are missing, buildings are decaying, Christendom is over. Only when we acknowledge the reality of our situation will we be able to effectively move in new ways to address it and be transformed–and, I believe, resurrected. 4. The Hedgehog Concept (Simplicity within Three Circles): a clarity about the organization’s primary purpose and mission, defined as what you are passionate about, what you can be the best in the world at, and what multiplies (for companies, profit and for non-profits, resources). This is, I believe, the hardest one for churches. We harbor the belief that we should be all things to all people. In some ways, we are right—just look at Matthew 25: “I was hungry and you gave me food, I was thirsty and you gave me a drink, I was a stranger and you welcomed me, I was naked and you clothed me, I was sick and in prison and you visited me.” So, in addition to offering awesome worship, excellent preaching, quality Sunday school for all ages, and being good stewards of our buildings and resources, we are also supposed to demonstrate excellence in food ministry, prison ministry, a clothes closet, hospital and nursing home visitation. Most churches do a great job at some, a mediocre job at others, and leave some out completely—and always feel guilty that we “should” be doing more. I remember attending a workshop with Gil Rendle where he said that family-sized (less than 50 in worship) and pastoral-sized (less than 120 in worship) churches cannot do everything, so they need to find what they do well and build from there. He told the story of a small church that hosted birthday parties and social events for children with special needs. At the time, I remember thinking that didn’t sound much like a church’s mission statement. 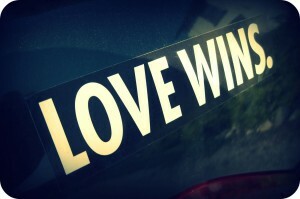 After all, we in the church are, first and foremost, about spreading the love of Jesus. While those birthday parties would definitely be something Jesus would like and approve of, they can’t be the central mission of Christ’s church. Yet I think that Rendle and Collins are on to something. We will never handle disaster response as well as the Red Cross, or homelessness as well as our local shelter, or clothing needs and job training as well as Goodwill. We should figure out what we can do in our community that no one else can do as well. Each church has its own culture, its own way of telling the story of Jesus, its own ministries that are part of its DNA. We can grow and strengthen the local congregation by discovering those spiritual gifts as a congregation and building on them. If opportunities or needs arise that do not belong, we will have to trust God to find another church that will be able to respond effectively. That means learning to say “yes” and learning to say “no” in discerning ways. I think that Jesus would be O.K. with that. After all, he did not heal all the crowds, nor did he seize every opportunity, and he said “no” to some times of teaching and serving so that he could be in prayer. God has the whole world, full of people of faith—God does not need our one local congregation to be all things to all the world. 5. A Culture of Discipline: people within the organization exercise a great deal of freedom and responsibility, self-disciplined by the Hedgehog Concept. This one needs little adaptation for the congregational context. When a church is micromanaged, or when someone must always be pumping up or directing in order for a program to happen, whether that is the pastor or board or committees or lay leaders, growth and sustainability are impossible. The church needs to have a shared sense of what its purpose is, what its core values are—and let the ministries unfold from there. If people are growing in discipleship, they are growing in discipline. 6. Technology Accelerators: use of technology and technological innovation does not drive success, but it can accelerate success if used in accord with one’s Hedgehog Concept. Church leaders share this misconception with corporate leaders: if we are declining or falling behind, it’s because we don’t have the latest technology; if another church is succeeding, it is because they use technology we don’t have. Collins proves this to be untrue. While technology used wisely will accelerate greatness, it cannot cause it. Technology might cause a short-term spike in energy or growth, but it will not be sustained. If you think technology is the cause of a church’s success, it’s only because they are using it effectively, in accord with a deeper sense of purpose. Churches that invest in technology without investing in developing the tools of leadership and purpose will only have empty robots and fancy screens. 7. The Flywheel and the Doom Loop: organizational transformation works like slowly pushing a flywheel, grinding and slow until others join and it gets momentum. The Doom Loop is the cycle of jumping from program to program, fad to fad, and replacing the ideas after they fail to produce success quickly. Oh, if only we could imprint this wisdom in the mind of every new pastor (not just new to ministry, but new to a congregation) and to all those expecting great things from them! Real, meaningful change happens slowly, invisibly at first, as a few core leaders begin to push the wheel. There are no overnight sensations that are lasting–it can take five, ten, 20 years for the change to really take off and have energy of its own. The “Doom Loop” is what happens when you implement a fancy new program that you think will change everything. When it doesn’t, you take your discouragement and go try something else. While I don’t think most congregations will give us 20 years to figure it out, if you start out with small changes, you can build momentum over the course of 5-10 years and see the congregation really begin to take off. 8. Built to Last: Preserve core values and core purpose while changing cultural and operating practices and specific goals and strategies. This one also seems obvious for the church world. Our core value (“love God with all your heart, all your soul, and all your mind”) and our core purpose (“love your neighbor as yourself,” and “go, therefore, to make disciples of all nations”) have been in existence for 2,000 years. When we keep those cores at the center of our life together, the church thrives—because it is being the church of Jesus. We can change “cultural and operating practices and specific goals and strategies” all over the place, as the church has through reformation after reformation. As you can see by the length of this review, I think Good to Great and the accompanying volume on social sectors have much to mine for leadership wisdom in the church. While there are plenty of passages and bits of advice that clearly don’t apply in an organization that is about people and not profits, developing disciples not customers, there is plenty to make it worth your time to read. 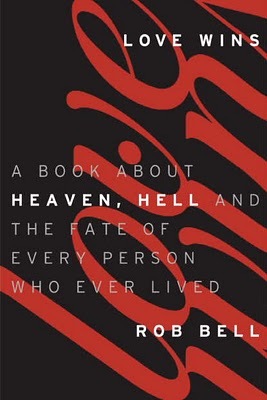 My biggest question at the end is about some of the companies featured in the book. In the most recent financial collapse, several of Collins’ “great” companies have fallen apart—Fannie Mae & Circuit City chief among them. The book is 10 years old, but these companies clearly did not remain great. I wonder if Collins has analyzed why—if they changed some of their behaviors after his book was written, or if he would change some of his analysis. 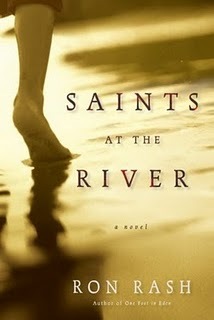 Saints at the River by Ron Rash, Henry Holt and Company, 2004, 239 pp. Ah, escape! I needed a novel to escape from a hectic and challenging time of pastoral care. I went to the library, scanned the shelves and returned with Saints at the River. It fit the bill. The novel tells the story of a young girl who drowns in a protected whitewater river, her body trapped beneath the rocks in a dangerous eddy. The tension in the story is between the girl’s family, who wants to dam the river to retrieve her body, and the environmentalists who have the law on their side to protect the river’s natural state. The story’s narrator, Maggie Glenn, is a photojournalist who hails from the small town at the center of the crisis, but now lives and works for a paper in the state capitol. She returns to cover the story, and (of course) deal with unresolved family issues from her past and present. The southern Appalachian mountain landscape and culture figure heavily in the plot as well. The story was well-written and interesting. In spite of the premise, it was not overly maudlin, and I was grateful to read something that was not emotionally wrenching, like the other novels I have been reading lately. If anything, the book suffered because it didn’t suffer enough. As a narrator, Maggie is detached from the action. She has loyalties on both sides of the debate, although she leans toward the environmentalists. No one in the book seems to struggle profoundly or emotionally with the death of the girl or the river. The situation just is. Saints at the River is not a book that will be particularly memorable, or that I found particularly inspiring, but I enjoyed it and I have no complaints. I just wanted something to escape with for a few hours, and this book did just that.